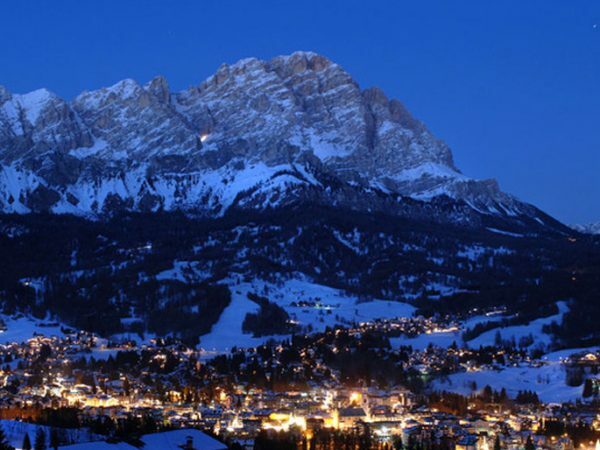 Cortina d’Ampezzo is known as the ‘pearl’ or the ‘queen of the Dolomites’ for its sheer beauty, which may have something to do with why the area became a UNESCO world natural heritage site in 2009. 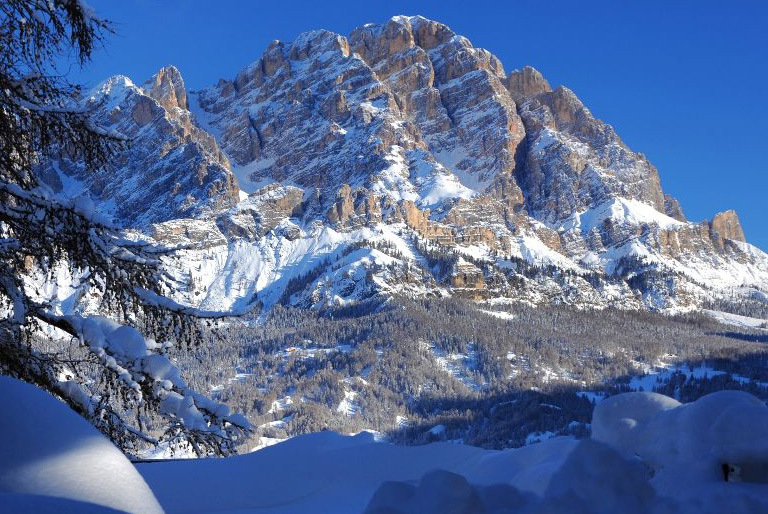 The British were the first tourists to start visiting the area back in the late 18th century and Cortina became famous when it held the 1956 winter Olympics, the first to ever be held in Italy. Despite the area jumping between Germanic and Italian ownership over the years it has its very own unique ‘Ladin’ culture. 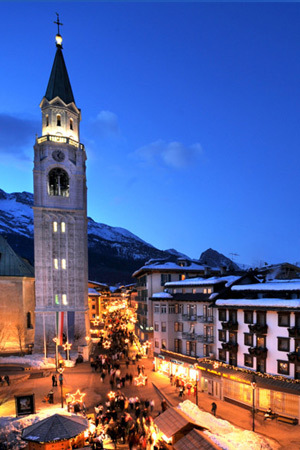 High Fashion brands such as Gucci, Bulgari and Moncler seem to outnumber the ski shops in the pedestrianised centre of town, but this seems to satisfy the jet set and the wealthy crowds who travel from far and wide. Its worth keeping an eye on the mountains for the ‘Enrosadira’ or ‘Alpenglow’ where the sunset turns the mountains fiery pinks, oranges and reds and then finally purple before descending into the darkness of night. 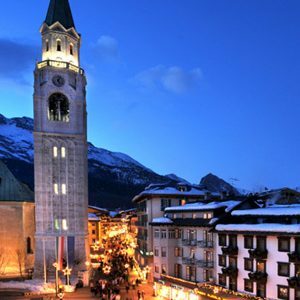 Cortina has three main ski areas, which are all quite separate from each other so one does need a car, chauffeur or local bus to get around. 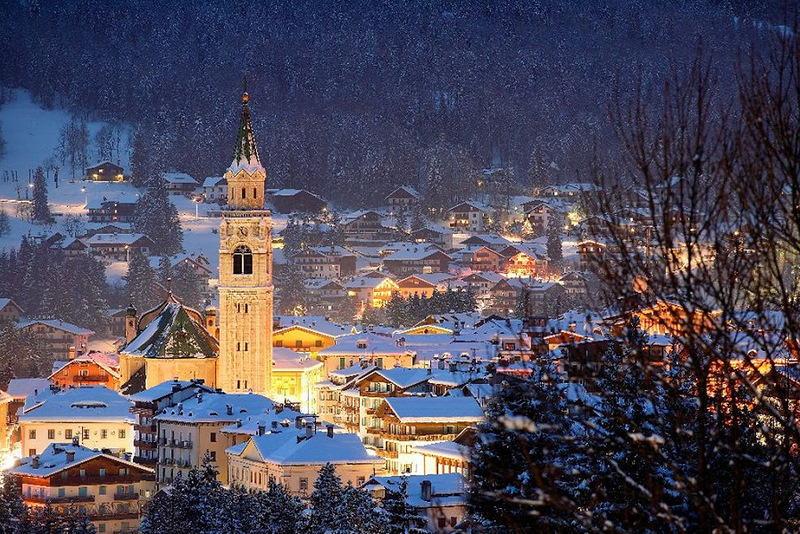 However, 70% of the local visitors are there for the food and the shopping so the pistes tend to be pretty quiet. It is generally best to choose an area to ski around for the day and then stay there. BEGINNERS – It is great to start on the Socrepes/Pocol nursery slopes. The lower part of the Pomedes area, has fantastic large nursery slopes and pistes to progress to. 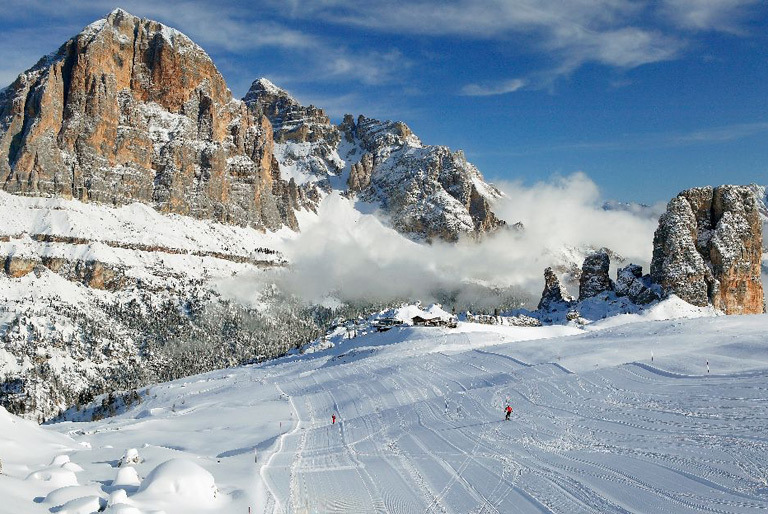 INTERMEDIATE – Most of the resort has a vast array of varied pistes set up for the intermediate skier. ADVANCED – The toughest skiing is to be found in the Tofana area. The 1956 Olympic run ‘Stratofana’ and ‘Olympia’ are great examples. There is some great steep skiing to be found in this area. OFF PISTE – When the snow is good, one can ski fresh tracks for days due to lack of local off-piste skiers. Good red runs. Excellent although fairly short north-facing runs. Mietres is specially built for children. 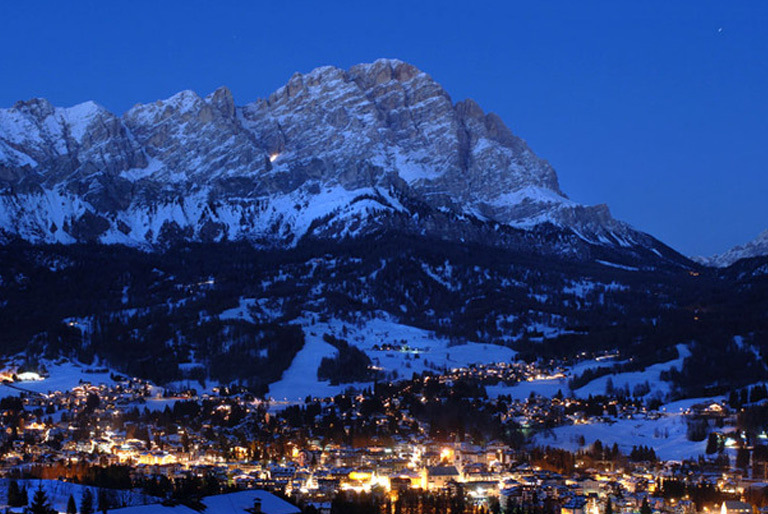 Tofana is the biggest area, with many blue, red and some black pistes to satisfy all levels of skier. One black piste- ‘Vertigine Bianca’ is left un-pisted or as they call it locally ‘Historic’! The Sella Ronda Circuit can be accessed from this area. 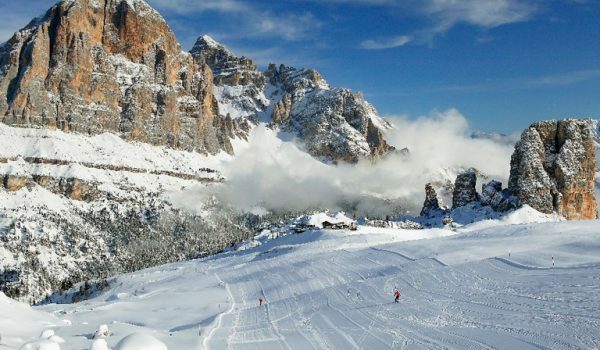 One can reach this area on the road to Alta Badia, 20km from Cortina via car or by taking a bus from the town centre or from the far side of the Pocol ski area. One can also ski the ‘Hidden Valley’ from this here. It is worth getting to the Falzarego pass nice an early to catch the first lifts up the Falzarego Cable Car to the top of Laguezoi at 2752m- from here one can experience stunning 360 views of the Dolomites, and the WW1 museum reminds you that people weren’t always skiing in these mountains! 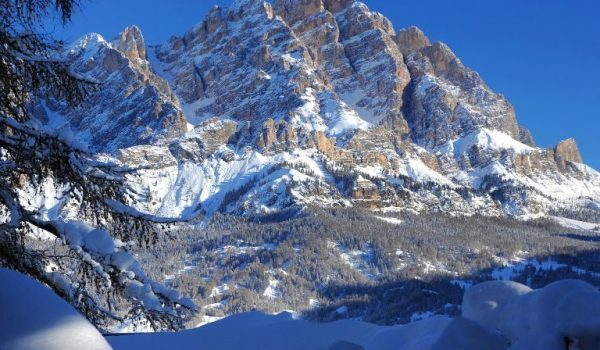 Ahead of you lies the 8½km ski all the way through wild mountains, with food at the Rifugio Scotoni, a rest at the Blue-Ice Waterfall and a horse-drawn ski tow to the Hotel Armentarola. We recommend the 5* Cristallo Hotel Spa & Golf. To know more about this property read our online review.